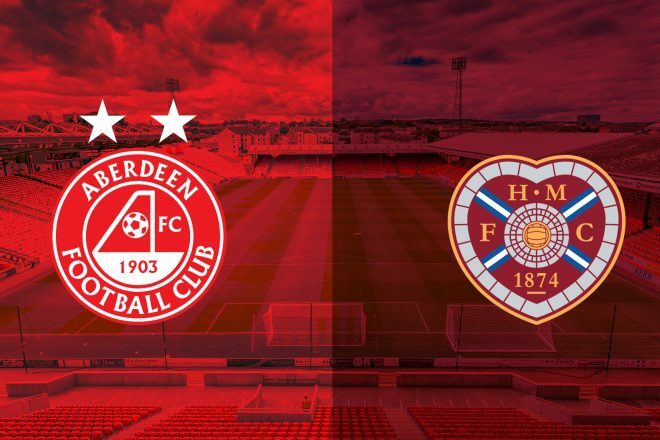 The Dons face Hearts in their penultimate home match of 2018. It’s been an excellent couple of weeks for the team with three wins in seven days and they’ll be looking to round off the year with maximum points in their final three matches that would see a surge up the table once again. They face a Hearts team who have been struggling for form the last few months after a strong start that saw them set the pace at the top of the league early on. On Friday morning Derek McInnes and Joe Lewis were in front of the press ahead of the match at Pittodrie. “The changing room is bouncing at the moment and I think you can see that on the pitch and hopefully on Saturday we can keep the positivity going. As stated previously, Hearts were the early pace setters in the league this season after winning eight of their first eleven games. After comfortably beating Dundee at the tail end of October they have endured a torrid winter so far losing four in a row between the start of November to December. They were able to stop the rot against St Johnstone and Motherwell, but suffered further setback last Friday in a difficult evening in West Lothian after they were hammered 5-0 by Livingston. Their early season form has helped them remain inside the top six, but the league is closer than ever this year and they’ll be looking to pick up the wins between now and the end of 2018 in order to consolidate their place in the top half. Saturday will be the 136th meeting between Aberdeen and Hearts at Pittodrie and The Dons hold the healthier record. There have been 60 wins for the hosts with Hearts leaving with the spoils on 43 occasions and 32 times the sides haven’t been able separated. There have been 203 Aberdeen goals and 152 for Hearts. Twice have The Dons won 5-0 against a Hearts side with the victories coming in May 1979 and February 1991. 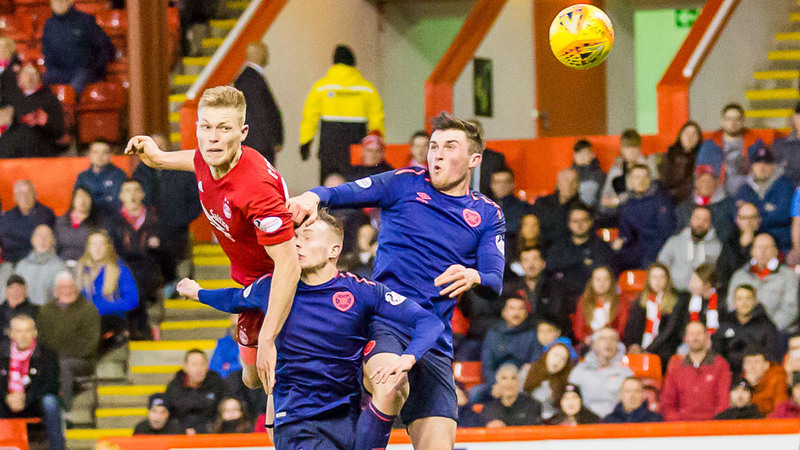 The Dons are currently on a four match unbeaten streak at home against Hearts with the last match ending in a comfortable 2-0 win thanks to goals from Anthony O’Connor and Gary Mackay-Steven. The Dons also haven’t conceded in those four matches. Earlier this season Gary’s penalty started a fightback from The Dons who were trailing 2-0 in Gorgie, but unfortunately they came up short and left empty handed. Last season produced two wins and two draws for either side with the final meeting coming in the split. 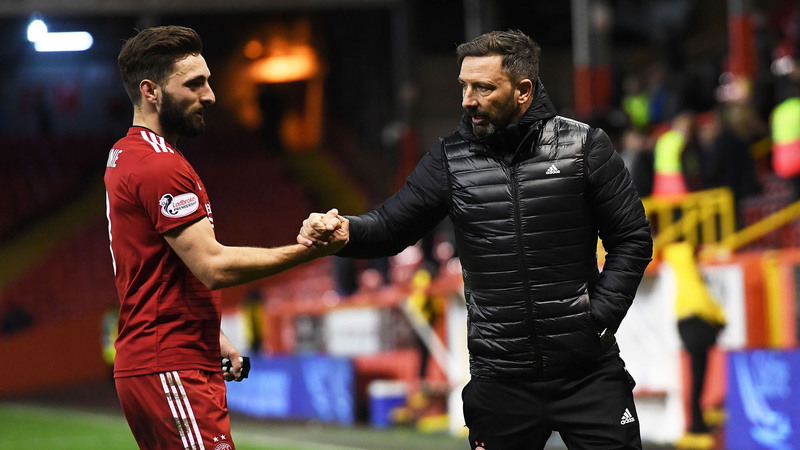 With Hearts having nothing to play for they came to Pittodrie for Friday night football and it was a match that The Dons really stepped up their ambitions to finish in the runners up place. A fine first half from the hosts had them in a comfortable position and much of that was down to Sam Cosgrove. The big striker had struggled to play his part thus far, but that evening he showed his potential by leading the line brilliantly. Anthony O’Connor scored on what was his final goal for the club and one became two when Kenny McLean brilliantly played in GMS and the winger slotted home for proved to be the winner. If you can’t get along to Pittodrie our RedTV coverage will begin at 2.45pm with former player Brian Irvine joining Dave and Andrew. RedTV International subscribers will be able to watch live and post-match we will have reaction, goal action, highlights and a full match replay. For the third week in a row Aberdeen named an unchanged side. The only change on the bench saw the injured Dom Ball replaced by Dean Campbell. They won a free kick out on the left. Then from a throw in, Lowe put it down the line and Hearts carelessly allowed Stevie May to get to the by-line unchecked. He did well to put over a floated cross. There was not a lot of pace on the ball but Cosgrove did brilliantly to steer the ball past Colin Doyle into the top corner with an outstanding header. It was very similar to his header against West Brom. The Hearts keeper, making his competitive debut, was picking the ball out of the net exactly on the minute mark. After losing five goals within the space of 14 minutes last time out against Livingston, this was not the start Hearts were looking for. It could have got worse for the visitors in the eighth minute. A promising break seemed to have come to an end when May could not quite find McLennan with a neat through ball, but May then charged down the clearance from Berra. The ball was worked to McGinn, but he went for goal from a tight angle and the ball went well over. Another good move involving May, McGinn and Lowe saw Aberdeen win the first corner of the afternoon which keeper Doyle took comfortably. Then a few minutes later McLennan put over a driven cross from the right. McGinn took it down on his chest before firing in a volley but it was straight at the keeper. Lovely technique from Niall though. 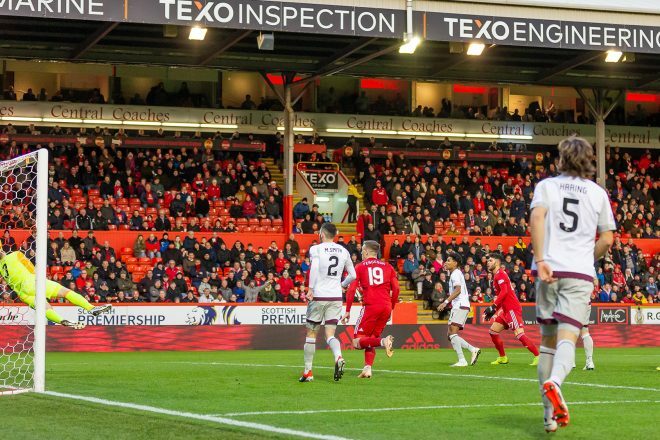 Hearts were like a boxer in the ropes in the early stages, but the Dons could not land that killer punch and they slowly worked their way back into the game. Just before the 20 minute mark Olly Lee put over a dangerous ball from the Hearts left but thankfully MacLean and Naismith had not made a run. Back came the Dons, after a really good patient build up, with the ball going from left to right and back to the left again, May held it up for McGinn and his low cross found McLennan and Cosgrove in space inside the area but Connor could not make good enough contact and then Logan’s drive was blocked. On 22 minutes Aberdeen won a second corner but could not win the first ball into the box. Then in the 25th minute Aberdeen had the ball in the net but it was ruled out. McGinn took a short corner to Logan who floated over a high cross. Lewis Ferguson went up for it with the keeper, both of them missed it, and the ball landed in the net. Referee Beaton blew for a foul by Ferguson on Doyle as the midfielder had an arm across the keeper. On the half hour mark Naismith went down after a tackle from Shinnie, leading to Hearts having a free kick in dangerous position. The Edinburgh side cleverly worked a triangular passing move which left MacLean one on one with Lewis, but Joe produced a very good block. Aberdeen then had a couple of promising forays into the Hearts area but the final ball was not quite good enough. By now it was a more even contest possession wise, but the Dons still looked the more threatening. With five minutes of the half to go Hearts won another free kick when May was harshly adjudged to have fouled Berra. Again they tried an inventive set-piece which almost gave Berra a chance at the back post after the ball had been flicked on but Lewis managed to usher the ball to safety. On 43 minutes Logan put over a good ball with his left foot before a quick throw saw Shinnie burst into the box but his shot was always going wide. At half time the Dons will feel they maybe should have been further ahead. There was a worrying start to the second half when Max Lowe pulled up with an injury. It was clear straight away that his day was over. 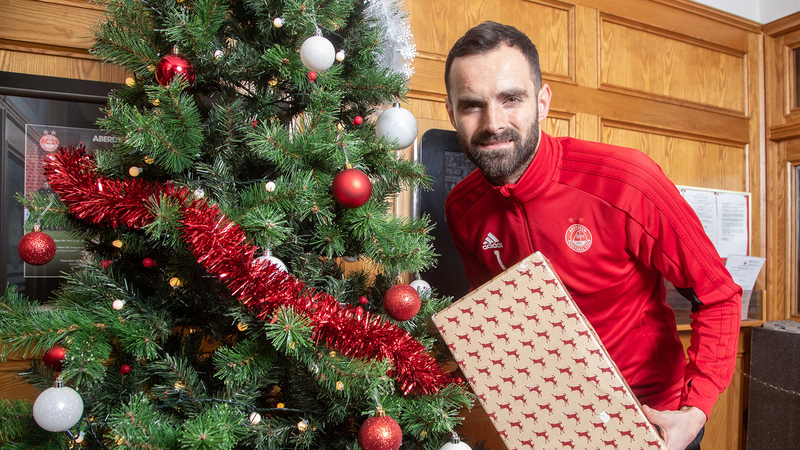 He was replaced by Dean Campbell with Shinnie going to left back. The Dons were under some pressure as they survived a stramash inside the area plus a strong penalty appeal when Haring was shoved in the air by McGinn. Then Shinnie got a vital touch to deflect a cross to safety. Hearts were starting to put some passing moves together as Aberdeen tried to get reorganised after the change. The game had now become a very cagey affair and a real midfield battle. On the hour mark Stevie May was replaced by Stephen Gleeson, as the Dons looked to try and get some control of the game again. Hearts were beginning to get on top, so it proved to be a very good tactical change. On 63 minutes Logan became the first player to be yellow carded. Demetri Mitchell and Peter Haring followed him into the book shortly after. On 68 minutes, after Shinnie was taken down, the Dons had a free kick about 40 yards out. McGinn played the ball over and Christophe Berra pulled down McKenna as they both went for the ball. Referee Beaton pointed to the spot. With no Gary Mackay-Steven or Stevie May on the field, Sam Cosgrove took the responsibility by confidently grabbing the ball, he had a while to wait as the Hearts players protested, but the big striker showed great composure to put the keeper the wrong way and coolly slot the ball home. A real pressure moment but Sam was up to it. Also worth noting, the Dons benefiting from yet another Niall McGinn set-piece. Tempers boiled over a few minutes after the penalty, with Naismith clashing with Ferguson when the Aberdeen man was on the ground. Naismith and Gleeson then had a pushing match before other players joined in. In the end Naismith and Gleeson were yellow carded. The Hearts player was substituted a short time after. The Dons had their tails up again and had found some energy from somewhere. Cosgrove played a lovely ball for McGinn to chase. Niall found Ferguson and his right footed curling shot was not far away. Then Shay Logan forced a corner after a strong burst into the area. Aberdeen were well in control. Hearts misery was compounded when Demetri Mitchell received a second yellow for a foul on Campbell and he had to walk. The Aberdeen performance was typified by Lewis Ferguson who was still crunching into tackles in added on time.